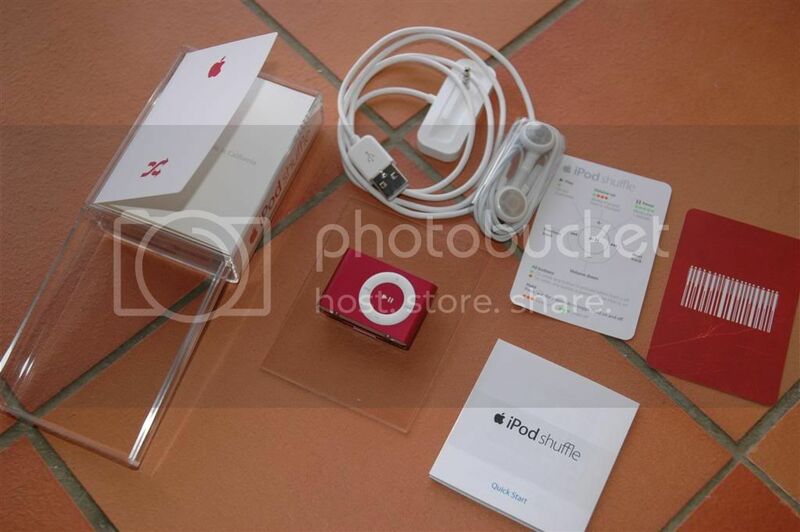 Recently I ordered a brand new 1GB Ipod Shuffle for 78SGD off the apple website, and it finally arrived about 3 days ago. Bought mainly for use during vigorous activities like jogging and cycling, and the prospect of "upgrading" it in the future for use even while swimming or snowboarding when equipped with special equipment. 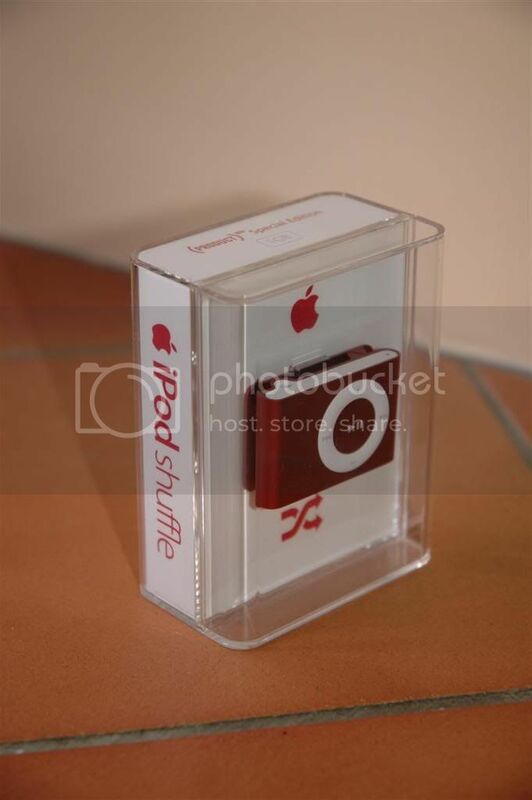 The Shuffle came in a pretty neat casing, but I wonder how much of the cost of the Shuffle actually went into the casing. 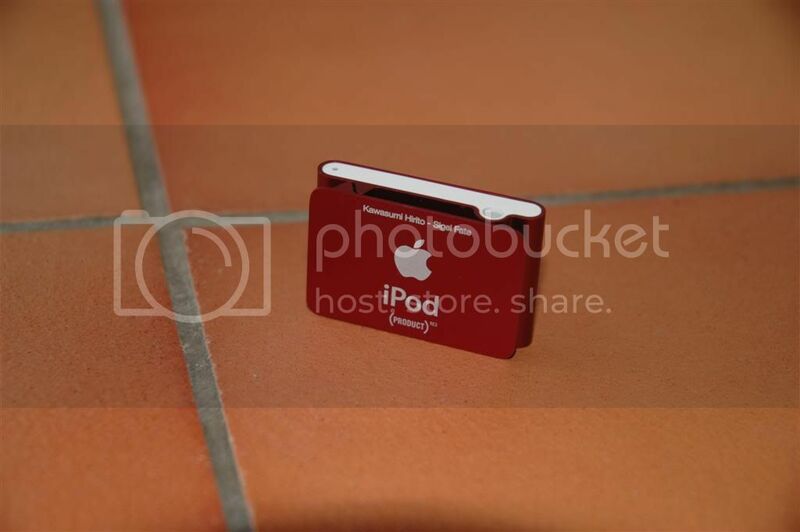 Back view of the Shuffle. I did request for engraving on it with my trademark nick, Kawasumi Hirito. Going off track for a moment. As mentioned before, Kawasumi was taken from Kawasumi Mai from Kanon. The origins of the name Hirito is slightly weird though. Back in sec 2 (8 years ago), I was trying to create an original alias to identify myself online, and it must also sound like a Japanese's name. At that time I was obsessed with Rurouni Kenshin, and was working around with his nickname Hitokiri Battousai. Eventually playing around with Hitokiri, the name Hirito came about and I liked it, and had been using it ever since. As for Sigel Fate, it's another nick which I've been using on/off for about 1-2 years, but definitely not as commonly used as my Hirito. The name Sigel actually came from Ah! My Goddess, the "Welcome Doll" that Banpei fell in love with and eventually named by Belldandy. And as for Fate... Fate Testarossa from the Nanoha franchise ^^. Would have wanted the engraving to be in japanese though, then it'll come out as 川澄 ヒリト　~シーグル フェイト~ . 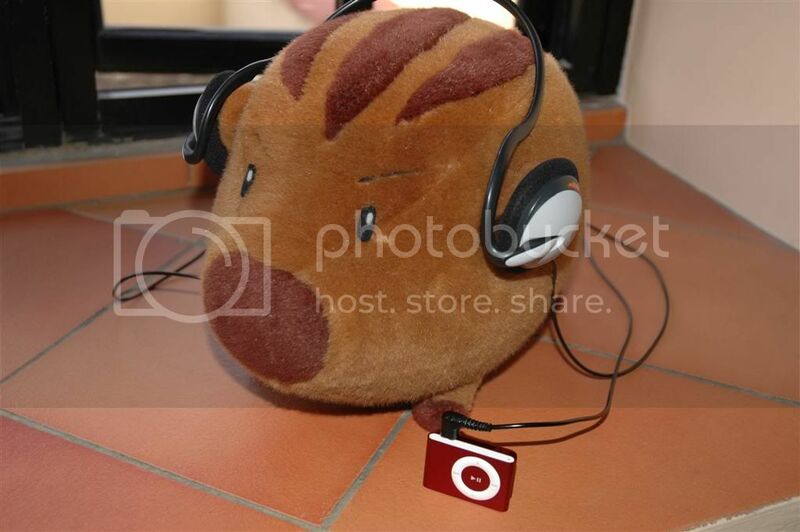 The Shuffle sounds so good, that even Botan can't keep his hands (or paws) off it! There's only one thing I don't really like about the Shuffle. The need to use iTunes to sync the mp3s in and rearrange the playlist is kinda troublesome. Maybe because my mp3 library is way too messy and needs re-organising. On a side note, I only knew about this last night. 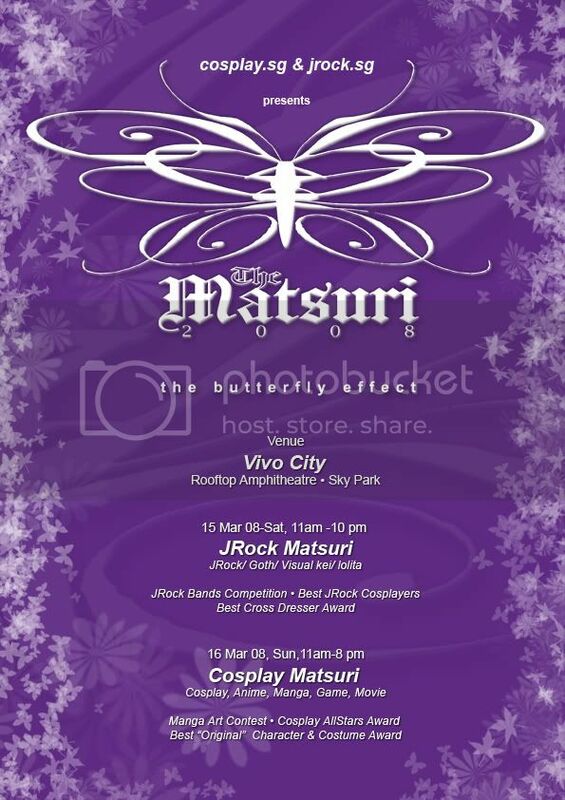 Apparently there a "Japanese culture" (I don't know what to call it, seriously lol) event at Vivocity this weekend, and surely there's going to be quite a few cosplayers. Sadly I'll not be able to make it for the Saturday (Today) events, but will try to make an effort to head down to Vivo tomorrow (Sunday) afternoon. Anyone else going for tomorrow's event? Maybe this might be a good opportunity to meet new people from the community in SG lol (I'm still new to all these!!). Signing off here, and to everyone: Have an Enjoyable and Interesting Weekend. Out. 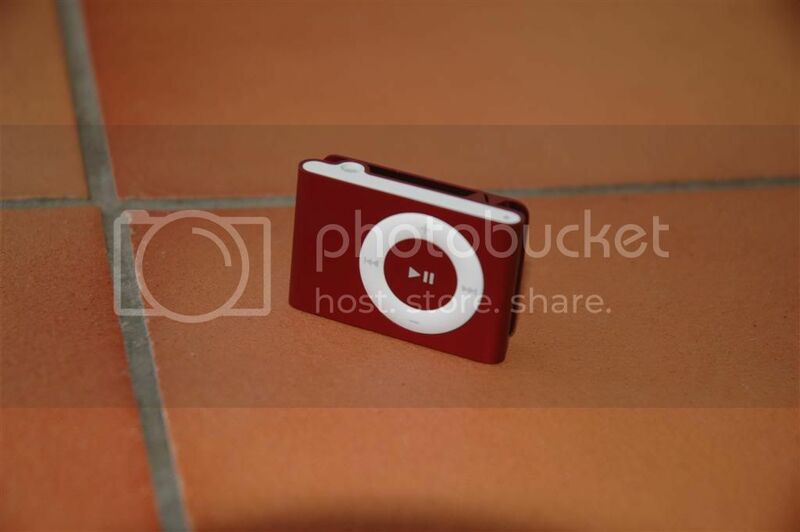 Lol I have the exact same MP3 player and it came without a brand, or a CD, and etc. No idea how to even reorder the tracks, they just play at random. Now I know what the hell it is. Screw iTunes though I never did like it. Well, at least I know now, lol thanks. On the subject of the cosplay event, I was never into it, so I would not have been interested in going down even if I could. As of the moment, I did something stupid to myself yesterday (blog has more details), so yeah, unable to go anywhere at the moment. Have fun if you are going down, but my opinion of SG cosplayers is practically summed up in the word called "fail". Had gone to a few SG cosplay events, mainly at the expo one, and sad to say the quality wasn't always good (I still find the guy who did the Full suit Freedom/Justice about 2 years back still the best. However looking at other's blogs on more recent events, the quality is surely going up, but definitely still not on par with Japanese cosplayers (too bad I didn't take any photos of them when at Comiket 73 Dec'07). Give them a chance and a few more years I'm sure they'll improve. I actually know two cosplayers myself, one of them is a male friend of mine and the other is his ex-school's friend (female). As to what they cosplayed before I have no idea, but apparently the girl is pretty good at cosplaying male characters, well, certain ones. Not too sure myself.